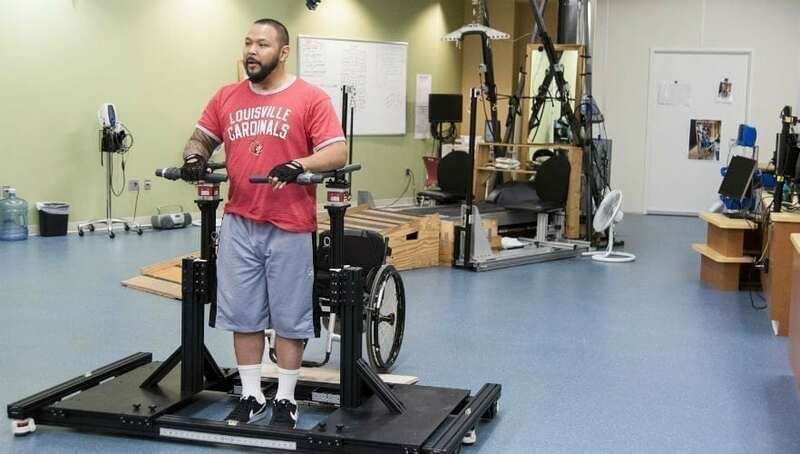 Patients with severe spinal cord injury (SCI) often experience chronically low blood pressure that negatively affects their health, their quality of life, and their ability to engage in rehabilitative therapy. Working with human research participants, Hirsch and researchers at the Kentucky Spinal Cord injury Research Center (KSCIRC) at UofL, have found that spinal cord epidural stimulation can safely and effectively elevate blood pressure in individuals with SCI along with chronic hypotension. The research was reported this month in Frontiers in Human Neuroscience. (Normalization of Blood Pressure with Spinal Cord Epidural Stimulation After Severe Spinal Cord Injury). Led by Susan Harkema, Ph.D., associate director of KSCIRC and professor of neurosurgery, the research included four research participants with chronic, motor complete, cervical SCI who suffered from persistent low resting blood pressure. The participants were implanted with an electrode array for epidural stimulation, and individual configurations for stimulation were identified for each participant. During five two-hour sessions, the participants’ blood pressure was elevated to normal ranges. Their blood pressure returned to low levels when stimulation ceased, and was again elevated to normal ranges with stimulation. Stefanie Putnam was one of the research participants. Following a severe spinal cord injury in 2009, Putnam’s blood pressure was so low she was unable to engage in the simplest of activities without losing consciousness. To help sustain her blood pressure, Putnam took medication, wore an extremely tight corset, and drank a large amount of caffeine. “I would still pass out,” she said. With epidural stimulation, Putnam said she immediately felt the effects. “I went from feeling like I was glued to the floor to elevated – as though gravity was not weighing me down. I feel alive!” she said. Because of the undesirable side effects of pharmaceutical and non-pharmaceutical interventions, Hirsch said epidural stimulation for chronic low blood pressure in SCI could have significant benefits. “People with severe SCI who have problems with resting hypotension have limited options. This intervention appears to reliably and reproducibly maintain blood pressure,” Hirsch said. This work builds on previous research at KSCIRC showing benefits of spinal cord epidural stimulation, along with activity-based training, in which individuals with SCI have achieved voluntary movement, standing and stepping, and improved bladder, bowel and sexual function. Harkema, the publication’s first author, said the blood-pressure research is promising, but must be tested over time and with a larger cohort of study participants. Next article What Would Happen if the Technology Sector Becomes Regulated?